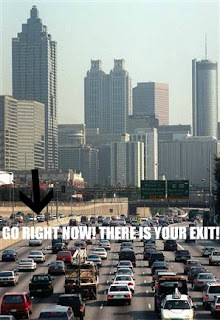 I can explain to everyone in Atlanta why the i85 "express lane" (toll lane) isn't working. It isn't because you have to already HAVE a Peach Pass in order to use it and none of us have that. I mean, that's an issue. Basically the traffic reporter goes ALL LANES ON i85 are AT A STANDSTILL BUT THE EXPRESS LANE IS WIDE OPEN!!! I think some of us might pop over and use it at that point but we don't have a Peach Pass in our car to make the sensor thing work so, that's out. It's not that the prices are REDONKULOUS - they are. And they seem to change every couple of days. At least on the signs I go past. These things are factors but not deal breakers. Here is the biggest problem. 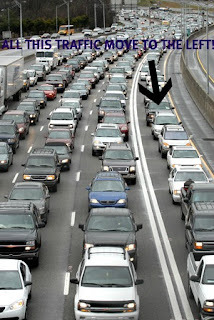 First of all you took all that traffic from the far left lane and shoved it to the right. That's one problem. Still not a deal breaker but it's why all the other lanes are borked. But here is the BIGGEST problem. The exits are on the right (this is just a random pic of 85 btw but the exit principle is the same). You put the express lane on the FAR LEFT SIDE OF ONE OF THE BUSIEST MOST CONGESTED INTERSTATES IN AMERICA AND OUR EXITS ARE ON THE RIGHT SIDE. During the time of day that we most need this express lane - it would be dangerous to impossible to get all the way back across to the correct lane to exit. Seriously, who planned this? Did the engineers involved ever actually DRIVE it in rush hour? PS you did a crummy PR job because I work with people who thought all of 85 was toll now. Great work. I give the 85 Express lane an F for totally FUBAR.